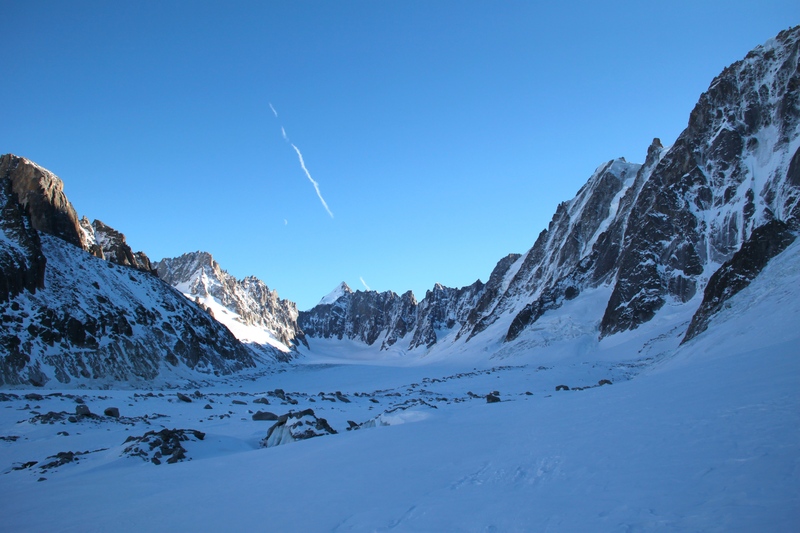 We have had no new snow here in Chamonix for over two weeks so Looking for something good to ski is out of the question. 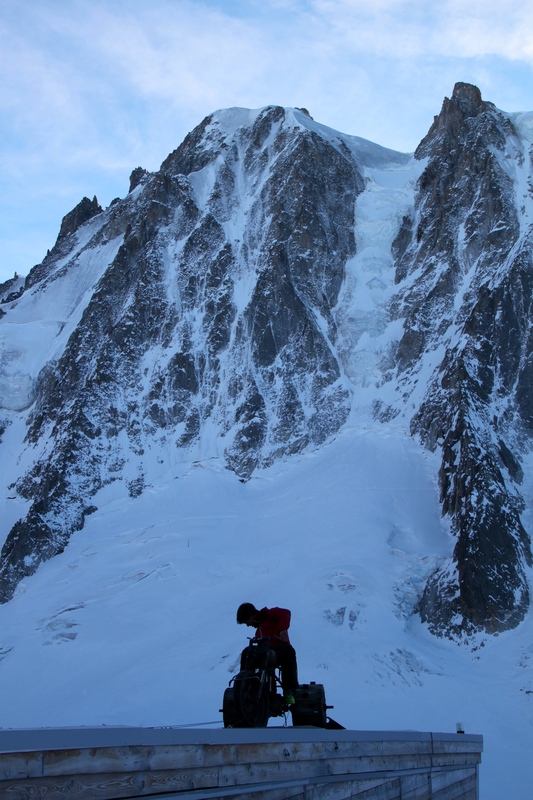 Alex was keen to get out and do something and suggested Petit Viking at the top end of the Argentiere glacier. Reading up on the climb it appears that the bergschrund is near impossible to cross so we looked at other possible routes up that way. The Charlet route on Mont Dolent looked like something that would be possible for me with my level of climbing and It also is on a mountain that has been on my list for a while now. 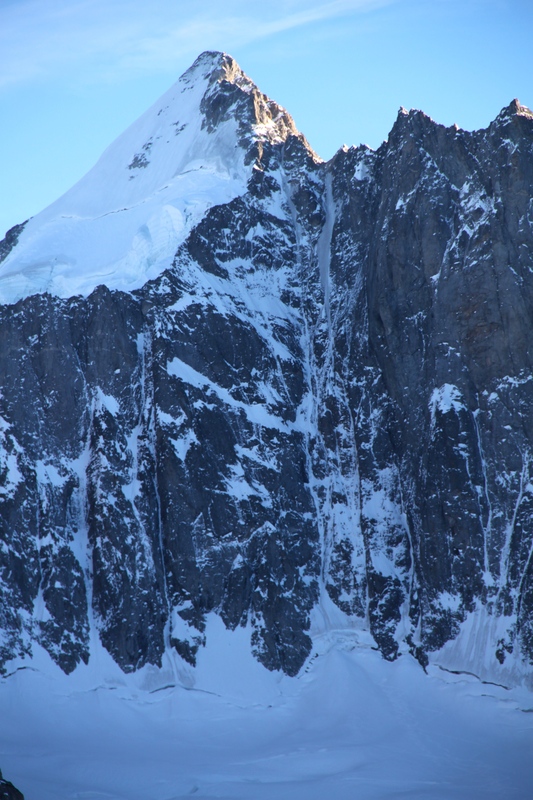 Mont Dolent shares its summit with France, Italy and Switzerland. Leaving Grand Montets Lognon station just before noon we headed up towards the bottom of the glacier and found a well run in track that would lead us up the right bank of the glacier towards the Argentiere refuge. Negotiating some parts of the moraine with skis was tricky and we had our skis off a couple of times, as it was too icy. Reaching the refuge about 3pm we had made good time and had enough time to go and play on some ice with our new boots. 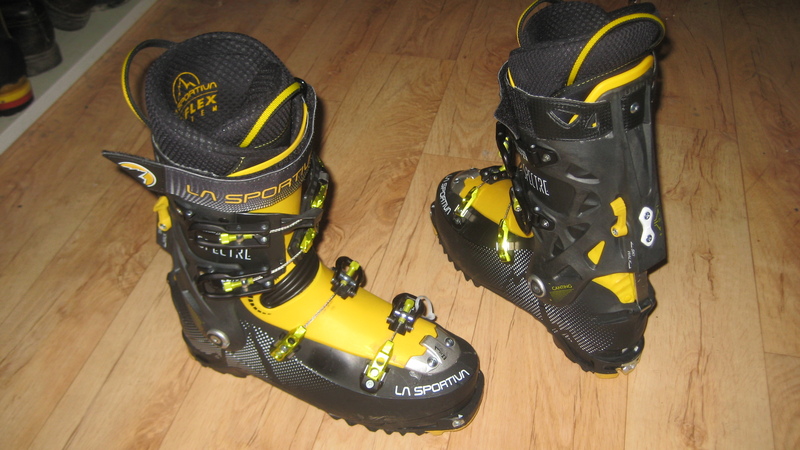 Alex has new Dynafit TLT6 and I have La Sportiva Spectres. We were both looking for a boot that was lighter than our current tech boots and something that we could use to climb with also. 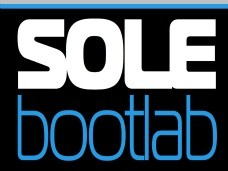 I had bought my boots the day before from FootWorks and was keen to get a good test out of them. Overall skinned about 10km, climbed a small free pitch of mellow ice and skied over 10km back to town on a windblown glacier and 700m of pistes. The boots were great overall. The had a bit of work done to them when I had them fitted to improve the fit on the last as they pinched, something which has been mentioned in other reviews. They felt good climbing in walk mode with the top two buckles open and the power strap still tight. I found that the power strap could stay on the whole time you are skinning too. I went to Grand montets yesterday and skied over 7000m of vertical on nice firm pistes, they performed better than my old Dynafit Zzeros. 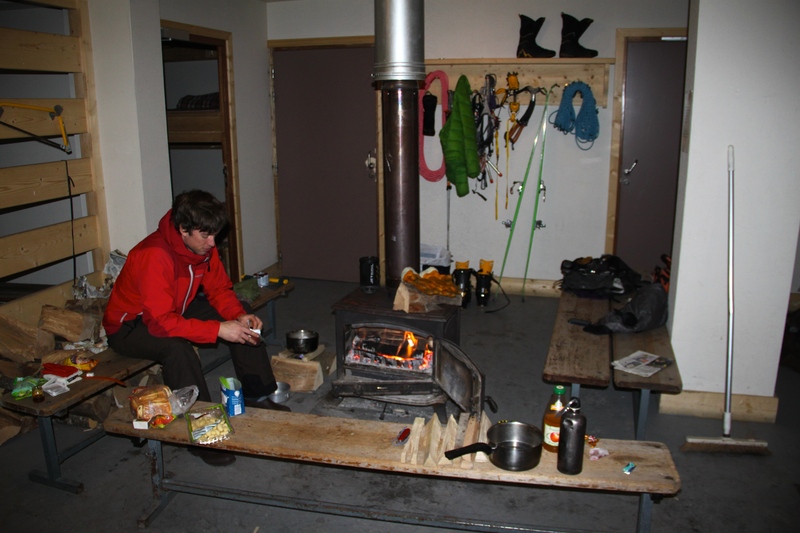 After another sleepless night in a refuge we set off just before 5 to go and climb the route. Both very tired but heading up the glacier steadily we reached the route just after 7. 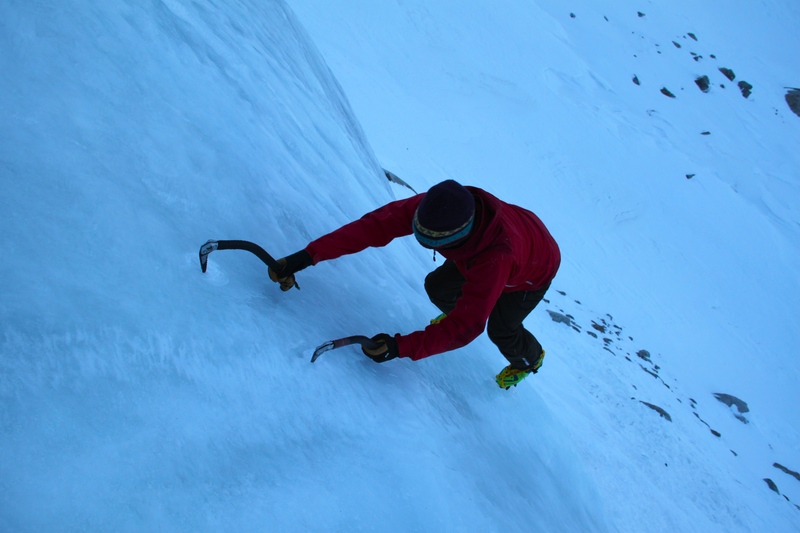 Skinning up there in the dark was amazing, It was very clear and still and the snow being firm made the going easy. 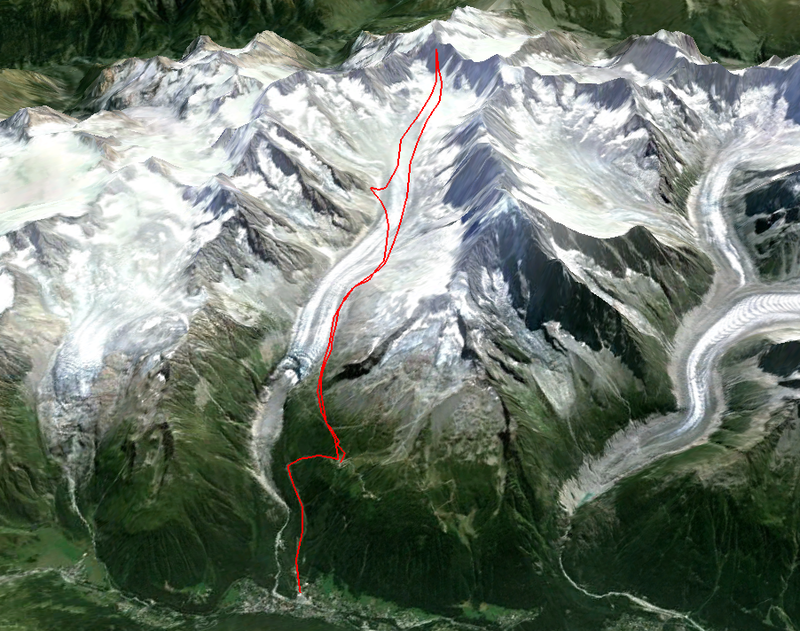 The route runs up the gully that tops out to the right of the summit. At the bottom of the route we could see that it was not in good condition. The right hand gully was very dry and what was there didn’t look good. The left hand gully was a grade harder and looked slightly better, although what we could see looked ok but we were not sure of what was above it and we were uncertain if it was possible to rappel the route which was a big concern for us from the beginning. After all this effort we decided to go home! We were umming and arring for a good half hour in the shade and getting very cold and loosing psyche quickly, add to that I noticed my crampon was broken! 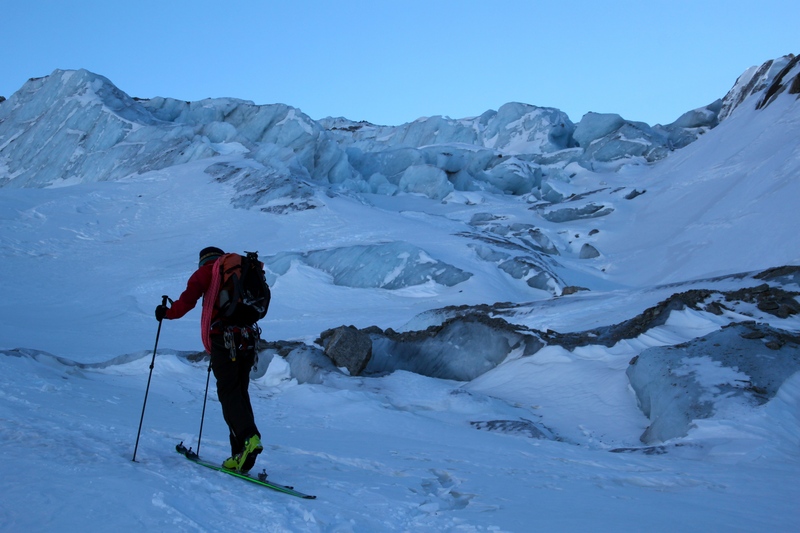 Now all we had to do was ski the 8/10km back down this relatively flat windblown crusty glacier. This was not fun. 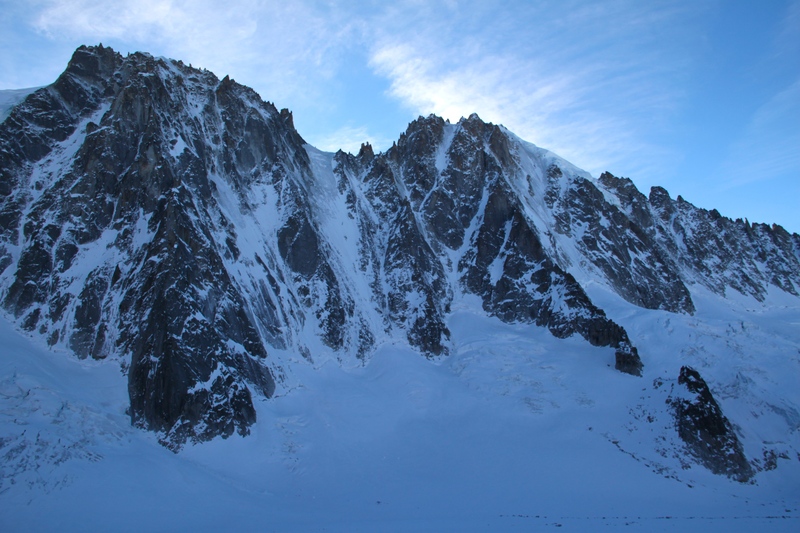 I managed to snap a couple of photos of the Droits and Courtes to show current conditions for those who want to climb them. After failing up the Le Tour glacier a few weeks ago I see these outings as training sessions and at least this time I got a good testing out of my new boots. With this good weather set to continue here in Chamonix I should hopefully get out and do something over the weekend and climb a route for a change. How is the other side looking? Many holes in the Tour Noir/Amethyst glaciers? Hey, They were looking pretty good. Much better than the Chardonnet and Milieu. We saw some people skiing down from the Col Tour Noir. Had a good look at them from the top of Petit Aiguille Vert today. I will put a photo up later, You can just about see the conditions.